Tagore was a constant, my mother insisted we tick off a reading list comprising Sarat Chandra Chatterjee, Bibhutibhushan Banerjee and Manik Bandopadhyay. During the interim between my graduation and masters, I voraciously read titles by all these literary greats. While each one bore a fascinating style, I found Sarat Chandra's works very easy to relate to. And understand. He was an everyman's writer portraying the plight of women in the society of the then Bengal. Interesting stories that you we heard about from our grandmas found place in his works as well. Woman were a pivotal point in his stories and often the plot revolved around the female protagonist. The ideals, conflicts and emotional quotient was so easy to relate to. 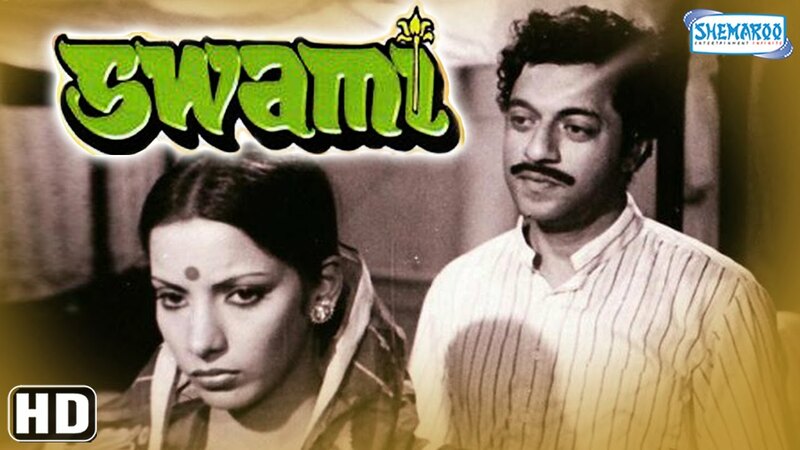 Swami is one such story from the master's collection depicting an array of human emotions and family setup in rural Bengal. It starts off showing Saudamini in a set up where her mind has been nourished by a sea of knowledge through the books her maternal uncle has been getting for her. Despite the backwardness of her village, Mini, as she is lovingly referred to by her uncle (Utpal Dutt in a very small role) keeps herself engaged with Thomas Hardy, Leo Tolstoy and the like. She is progressive, a dreamer and someone who doesn't mince words. Her incessant clashes with her mother are good-humoured but it also reflects the conflict between her modern thoughts and the widow's jaded beliefs. The middle path is attained by the uncle who keeps supporting Mini's ways and admonishing his own sister for being so old-fashioned. Mini's existence is flushed by an exciting romantic interlude though for a short span of time and the young girl starts building castles in the air little realising that she will be let down ot only by circumstances but by her own beloved uncle. But Mini has more pluck than her mother can imagine. She decides to elope with her lover but fate has other plans. A nasty stroke of bad luck befalls the family and Mini is married off against her wishes to a wheat trader called Ghanshyam. Mini feels dejected after marriage and maintains an aloof distance from her husband who is a saint soul. She does not get too involved in the domestic operations as well because for her this marriage is a punishment. But there is a time when Mini does change. She realises that for Ghanshyam she is the only near one and he does love her. He might not say it too often but the feelings are reflected through his actions. restraint by Girish Karnad). While he is the step son of the family, his step mother very cleverly makes sure that her own son gets all the care and adulation while Ghanshyam's desires and needs are neglected. Gradually, Mini takes charge of her husband's needs and the two start getting close. But Basu Chatterjee wasn't able to develop the chemistry between Shabana Azmi and Girish Karnad and so I'm a little confused about each other's feelings here. Towards the end when the problems are resolved there is one question that keeps surfacing in my mind. If Ghanshyam loves his wife how come he lets his family insult her and then to add insult to injury he demands that Mini apologise to the matriarch (wonderfully portrayed by Shashikala). While the story is a small one, I feel the director should have invested more time in developing the bond between the leads because then Mini's reconciliation would have been justified. For a girl who is erudite and well-read, self-esteen and honour should be a bigger issue than slight and insult. This thread is underdeveloped here. Also, if Ghanshyam was aware of Mini's nubile romance, how come he continues to be so calm all the time even when Narendra walks into his house and is seen holding Mini's hands clandestinely. Why does he insist Mini take care of his basic needs when he comes visiting? Is he testing her? And then he believes his mother and orders Mini to apologise? Why? Questions galore. Guess the times were different then. Shabana Azmi puts up a very measured performance as Mini, a woman whose mind is in a conflicting state even as she buries her past and embarks on a new life with her husband. The moment she sees that her husband is being wronged she speaks up. This woman has a mind of her own and will not be a mute spectator. That fiesty temperament is projected well by Azmi.